Stats/Setup: I rode the Ride Berzerker 161 with Union Force SL bindings and Salomon Dialogue boots (size 9.5) at a Mt. Hood Meadows demo. I am 6 feet 1 inch tall and weighed 165 pounds at the time. First impressions: This scene from Clerks. Lots going on in that topsheet. Says 'Made in China' right there. If it made me ride like Jake in Naturally I would buy any board, no matter where it was made. Lighter than average dangling from my foot. Let Ride tell you the rest. Some specific technology may be hard to find. The Ride: Wow, I like this board. It may be my favorite board yet. It ate up the tree slalom course, popped like a champagne cork on a contest podium, and evened out the chop like you were riding behind your own personal grooming fleet. This board gets edge to edge so fast, other DJs say, "Damn." This is owed partly to its narrowness (25.0 at the waist of a 161 board). Big-footers, fear not; the Berzerker is also available in a wide platform for the big dogs. The nose rocker also helps with turn initiation, while the camber powers you through and on to the next one. Speaking of camber, this board pops. I don't know what Pop Rods are, but couple them with camber and this board want to get off the ground. Maybe that's the carbon in the tail the rep mentioned. I think they're in the nose, too (the website is pretty unclear). That would help keep you from going over the bars on pow landings. Seeing how narrow this board was coupled with the nose rocker, I was surprised at how stable it was at speed. It blazed hard through some dicey conditions on a flat base or on edge. The edge hold was remarkable for a non-wavy sidecut. The flex was mid-firm. Ride calls it 7 of 10 and I agree. The nose rocker helped out presses; the tail, not so much. It was just waiting to pop you. I did not test in pow, pipe or on rails. The last two might not be it's bag, but it should rip the pow apart. Note the nose rocker and set-back stance. Things to keep in mind are its narrow overall width and long relative effective edge. This will translate itself better into high-speed pow applications. Not for beginners or the timid. Size up and step up. 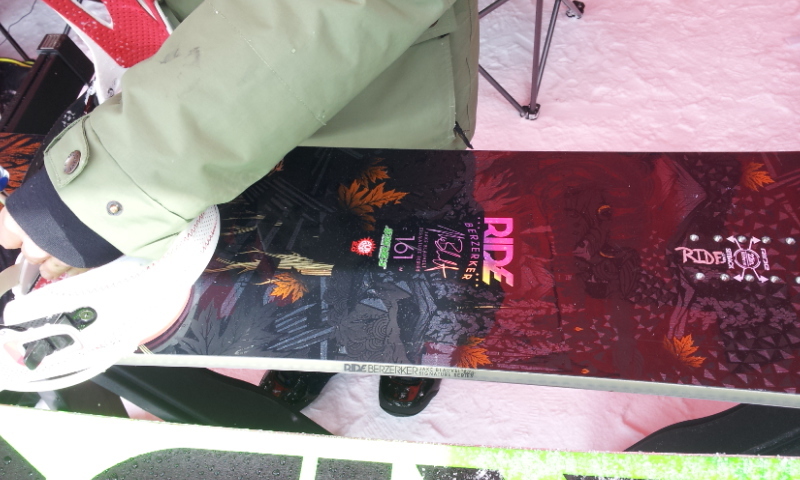 Bottom Line: A damp, yet poppy freeride board. Straight-line aggro and fast edge to edge. Pow-friendly features and stable on the hardpack. I'd buy this board. In fact, I tried to find it in a 164 after the demo for a good price, but failed. My love for you is like a truck, Berserker.